Set in 1952, the film tracks the true story of a brave rescue mission by a U S Coast Guard crew at Chatham, headed by the amicable coxswain Bernie Webber (Pine), manning an inadequate motor lifeboat.When S S Pendleton breaks into two, it is the second ship to go that way in that fateful storm. 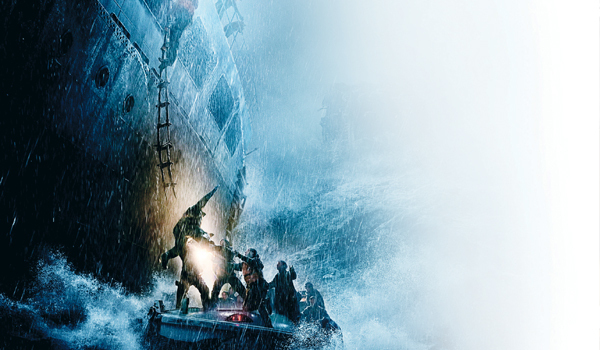 The sinking stern traps more than 30 sailors including the cantankerous engineer Ray Sybert (Affleck), who reluctantly manages the survivors. Meanwhile all rescue hands are busy with the S S Fort Mercer that went down earlier and it is now up to the Chatham base to respond to Pendletona��s SOS call. The film features over 1,000 visual effects shots. Cast: Quinton Aaron, Sandra Bullock, Ray McKinnon? Following a tough childhood in foster care, teenager Michael Oher (Aaron) life takes a different course when football coach Burt Cotton (McKinnon?) discovers his talent for the sport. Soon Oher is accepted at Wingate Christian School despite a lower GPA. But Oher struggles are now about his learning difficulties and the patronising attitude of those around him. However, when he meets Leigh Anne Tuohy (Bullock), one of the parents visiting the school, Oher discovers a whole new world filled with possibilities. Julia Robert was initially considered for the role of Leigh Anne Tuohy. Mandar Ponkshe (Devaiah), a 30-something corporate professional is all about a�?no-strings-attacheda�� arrangements. His amorous expeditions range from college girls to married women, yet Mandar finds himself feeling lonely. Under the counsel of his best friend Dilip (Deshmukh), Mandar signs up with a matrimonial site where he meets Tripti (Apte). Smitten by her attitude towards life, he tries to be honest about his past but ends up projecting a gentlemanly image of himself. Things go downhill when his promiscuous past catches up with him. The working title of the movie was Vaasu, a Mumbai slang for the word lecher. When S.H.E.I.L.D tries to replicate his ant-man suit that is armed with shrinking abilities, Hank Pym (Douglas) resigns from the fraternity, fearing exploitation. Despite his attempts to keep the technology a secret, Pym learns that former protA�gA� Darren Cross has nearly succeeded in making a horrific copy, the Yellowjacket. Unaware of the circumstances, desperate ex-con Scott Lang (Rudd) breaks into Pyma��s house and takes off with the ant-man suit. Having accidentally discovered the suita��s powers, Lang tries to return to it, but little does he know that Pym has a whole new path planned out for Lang. In the comics series, Ant-Man is a part of The Avengers. After a tumultuous divorce, Maya (Basu) moves back in with her parents along with her daughter Nia (Dhawan). Soon after her ex-husband (Siddiqui) dies in a car crash but Maya hides the news from Nia, who is just settling down after the split. But things start getting weird when Nia claims to be able to see and speak to her deceased father. Maya becomes increasingly anxious when the children and teachers who bully or scold Nia at the school are found dead under mysterious circumstances. Aatma is Bipasha Basua��s sixth horror film in a row.